Ritchie Valens - Come On Let's Go - home movie 1958? Buddy Holly, Ritchie Valens and the Big Bopper played their last concert at Clear Lake Surf Ballroom, Iowa, on 2nd February 1959. At 00.55 early the next morning they took off from Mason City, Iowa, and their plane crashed in a snow-storm several minutes later. The day the music died. 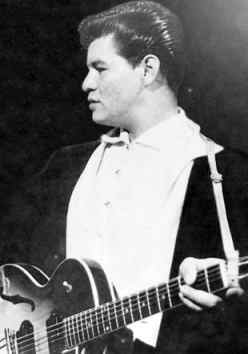 Ritchie Valens was born Rchard Valenzuela, on 13th May 1941. He was just 17 years old when he died on that infamous day of 3rd February 1959 (the day the music died). He perished on a snowy night near Clear Lake, Iowa, in the plane crash that also took the lives of Buddy Holly, the Big Bopper and the pilot of their small plane. 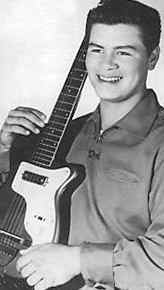 Ritchie Valens was no aspiring artist, he had just attained three straight US hit records. These records were "Come On, Let's Go", and the double sided "Donna" / "La Bamba" . This was no mean feat at a time when top hit records depended upon massive record sales and it has been achieved by few other artists. His hit "Donna" was about a childhood sweetheart, Donna Ludwig. The record was "covered" as was the trend at that time by Marty Wilde (father of Kim Wilde) in the UK. "Come on, Let's Go" was been covered in the UK by Tommy Steele. Ironically, it was the B-side of his hit "Donna" that became probably his best known song and subsequently the title of a film about his life, La Bamba. The Los Lobos re-make hit number one in both US and UK. ..... and he was just 17 years old.